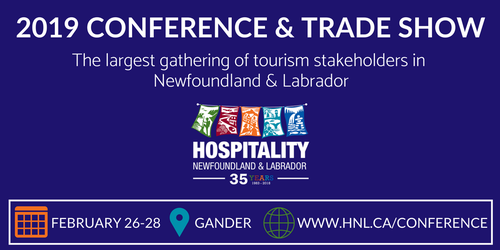 Hospitality Newfoundland and Labrador’s Annual Conference and Trade Show is the largest gathering of tourism stakeholders in the province. Attendees have the opportunity to network with leaders in the industry and gather valuable information that will affect tourism in the province. Network and learn with over 300 delegates, exhibitors and industry partners during this three-day event. Stay tuned to www.hnl.ca/conference in the months leading up to the event for all the latest details about sessions, events, speakers and trade show exhibitors! For more information on conference registration contact Hospitality NL at 1-800-563-0700 or hnl@hnl.ca. Room rates include continental breakfast. Cut off for these rates is January 25th, 2019. Cut off for these rates is January 25th, 2019. Hospitality NL offers several new registration options that give delegates choice when it comes to experiencing the event. Learn more. Refunds of registration fees will be granted less a $75.00 administration fee until February 15, 2019. Cancellations must be received in writing at the Hospitality NL office on or before this date. Please send cancellation requests to Susie Greene. We regret that no refunds will be granted after this date.